Learn how to identify a voltage swell as a recloser operation in order to actively correct and prevent other possible causes. A 140V voltage spike in the RMS voltage stripchart from a residential PQ recording can be indicative of a loose neutral, switching problem with a capacitor bank, or faulty voltage regulator, to list just a few possibilities. Recloser operations may be added to the list. Fortunately their characteristic timing and lack of severe distortion in waveform shape distinguishes them from other more serious events. Swells are best spotted in the RMS Voltage and Current stripchart. 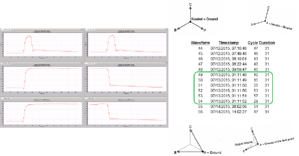 Once spotted, the waveform capture graphs may be used to separate RMS changes from other waveshape signatures, and the RMS capture graph and timestamps help quantify the swell magnitude and timing. Conclusively identifying a swell as a recloser operation allows for corrective action (e.g. better grounding) if needed, and prevents searching for other possible causes of a swell.